There's an eye-catching cover for you. I don't know who the artist is. 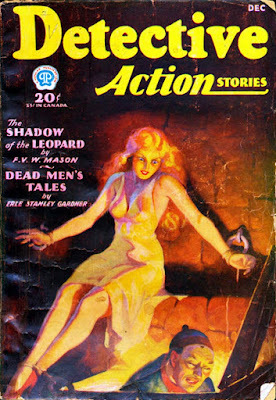 But the authors in this issue of DETECTIVE ACTION STORIES include Erle Stanley Gardner, F.V.W. Mason, J. Lane Linklater, Howard Morgan, and Earl and Marion Scott. Those last three, I don't know anything about, but any issue with Gardner and Mason is probably well worth reading.